The man charged with the murder of Worthing grandfather Donald Lock appeared at the Old Bailey today (September 25). Matthew Daley, 34, is accused of murdering 79-year-old Donald Lock following an alleged road rage collision on the A24 at Findon in July. Daley is charged with murder and possession of a bladed article. Dressed in a black and white striped shirt, he appeared at the Old Bailey in London via videolink from Belmarsh prison. The case has been listed for mention in the week of October 26, with a plea hearing listed for October 30. 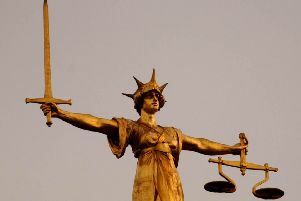 A provisional trial date has been set for November 16 at Lewes Crown Court. Cycling enthusiast Mr Lock, who had recently been given the all-clear from prostate cancer, died at the scene on the A24 at Findon on July 16. He was on his way back from a gathering of members of Worthing Excelsior Cycling Club when he was stabbed multiple times.